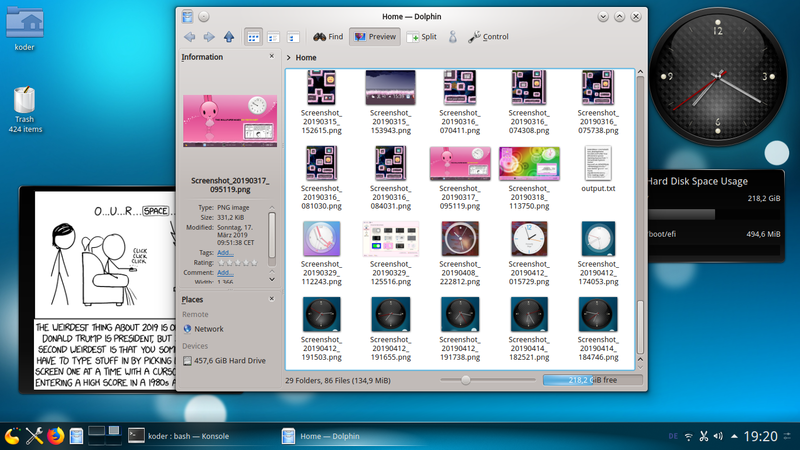 In the 11 years since Plasma was released first (January 11, 2008) there has been some evolution of the theming options. Sadly also sometimes regressions in the support of older options were introduced, mainly in the early phase of Plasma 5 when code was ported to QtQuick 2 and the new default theme Breeze did not expose the regression or even triggered some changes for its special needs or for simplifications it allowed. Given Breeze as default was pleasing to most, and possibly some alternative theme designers were lost during the longer phase from a pleasing KDE4 to an again pleasing Plasma 5, and new theme designers made their themes directly matching latest Plasma 5 Theme support, the piled-up regressions were not a real issue for those contributing. 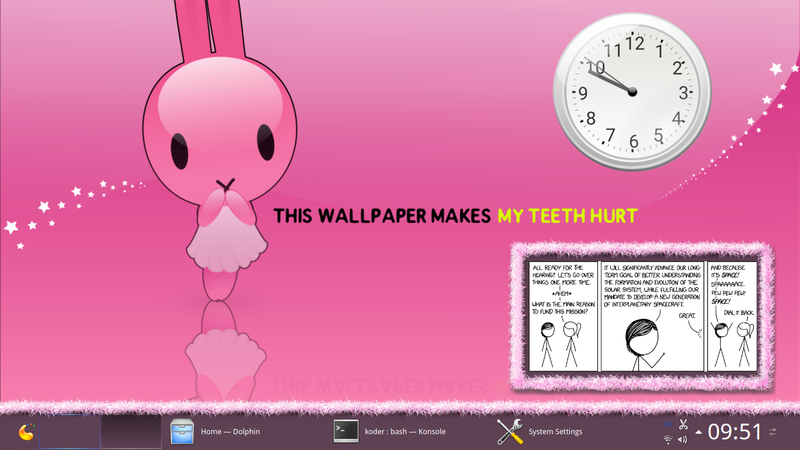 Well, not a real issue unless on started to restore an old theme like “Fluffy Bunny”. And was wondering why it looks broken. And then wondering the same while playing with all the other old themes still available on store.kde.org. So much partially good artwork being broken made my heart bleed, and in the absence of own designer abilities it was time to document the regressions as well as fix some code where possible to restore previous variability. So, theme designers, please find a a new page on techbase.kde.org about Porting Themes to latest Plasma 5. It lists the changes known so far and what to do for them. Please extend the list if something is yet missing. 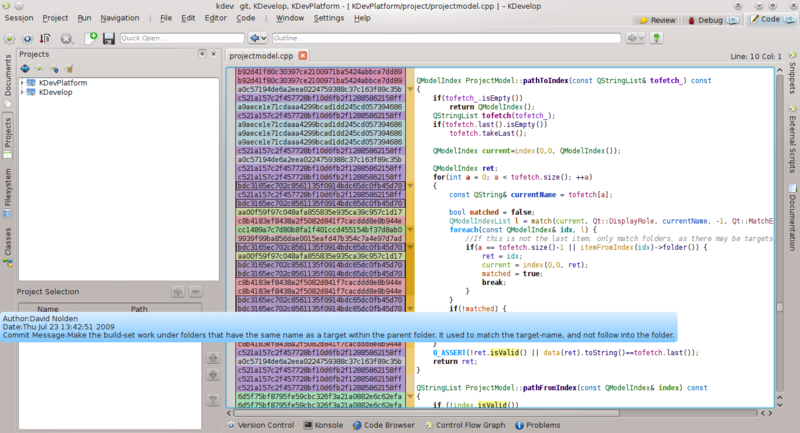 One might test the fixes in the code against one’s themes with latest development versions of Plasma using Live images. And even the Oxygen & Air themes, the default Plasma themes during KDE4 times, while being maintained as official themes part of current Plasma releases, had suffered some small regressions (e.g. analog clocks hands rotation point or progressbar height). No more, with Plasma 5.16 the visual experience of Oxygen & Air should be closer to the original. 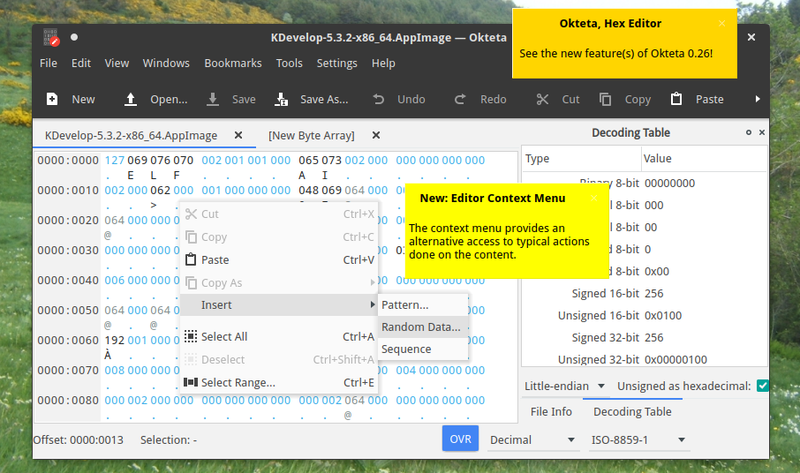 And while there now is a list of things to do to make old themes work again, many themes on store.kde.org no longer are maintained. There is talk about separating those, e.g. at time of Plasma 5.16 release, so there would be a clean list of working and maintained themes for latest Plasma 5. 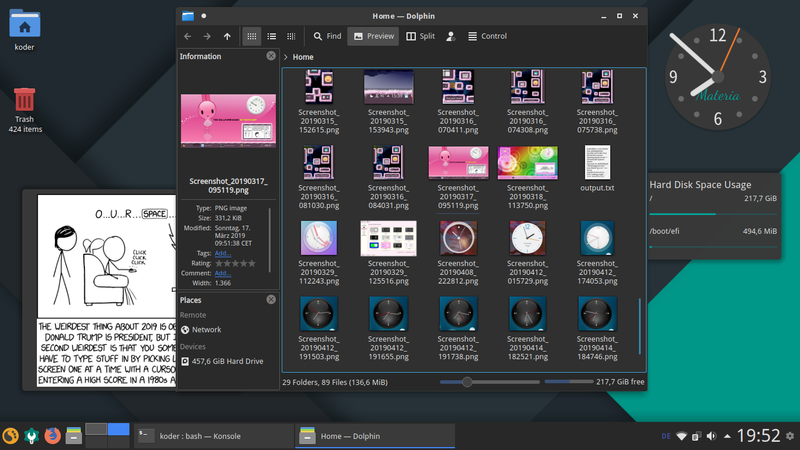 Well, besides the regression Plasma5 has over the old Plasma 😉 With only thin & non-tiled border themes trendy and used the last years, sadly current Plasma has some issues, also does it assume that borders of panels are rectangular when creating the default BlurBehind mask. Some first patches (1, 2, 3) are already under review. 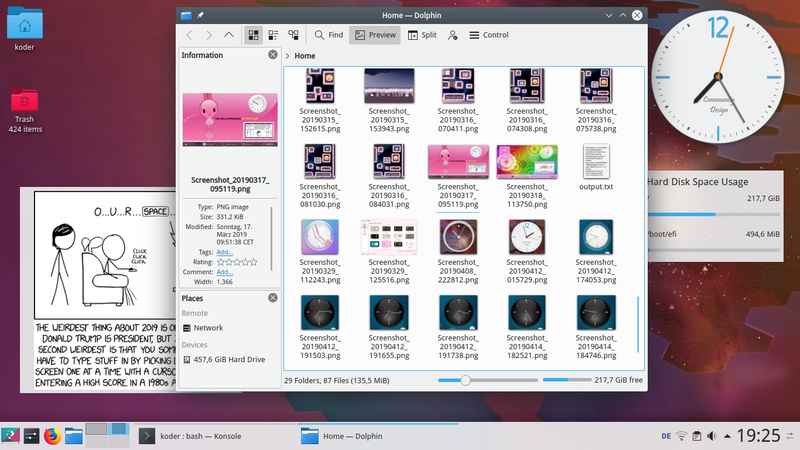 Next up: restoring the “Plasma Bunny” theme from the once drafted “Fluffy” linux distribution… less flurry, but more pink! Update: First version of new named “Unicorn” is now up in the store for your entertainment. TL;DR Beware of connections to function objects accessing class members which could be triggered during execution of subclass destructor methods. Oh, those name-based signal/slot connections feel outdated! Looks fine & compiles. Code feels more future-proof with the compiler now warning if some signal or slots got changed/removed. Just… nooos, it sometimes crashes now, in the destructor of MyWidget. How that on this innocent looking change? The connection will automatically disconnect if the sender or the context is destroyed. However, you should take care that any objects used within the function object are still alive when the signal is emitted. Which subtly hints to the problem we now have: if the form instance is set as child widget of the MyWidget instance, it will be deleted when ~QWidget() is run as part of the MyWidget destructor. And then emit the destroyed signal. At that point in time this as seen by the function object no longer is a proper MyWidget instance. And things go *boom*. The old string-based connection as well as the member-function-pointer-based one handle that case for us, by some QObject magic using virtual methods which catch that the receiver no longer is a MyWidget and somehow then just drop the slot call (got lost in the code details, but it is something like this). While with the new function-object-based connection that one will only become automatically inactive by being destroyed if the ~QObject destructor of either sender or receiver is reached. So having a longer lifetime, which can come a bit unexpected to some. As I seemed not the only one hit by this, I filed QTBUG-71432: “API dox of context & function object using QObject::connect should hint about destructor issues” so other people like me might be saved from this from the start. Curious to learn about best practices for private slots and non-string-based connections. Thus happy to hear about proposals/hints in the comments. When working on existing code bases, now and then one reads code that raises some questions and the desire for more context, to understand the purpose or the intention of that code. Context like the commit message, the author, the commit date, or some review discussion of the commit or some bug report or feature request the commit was done for. KDevelop, the extensible cross-platform IDE for C, C++, Python, PHP and other languages, has supported showing line-by-line commit data annotations since many years, starting by showing the commit id and in the tooltip info like author, date and message. Not everyone was capable to deal with raw commit ids, also is it just a reference to the actual metadata, so since some versions of KDevelop the annotation border was changed to show the author name and the commit year instead. While year and author are already interesting info about a commit, if one is looking at a bunch of lines coming from different commits, it can be unpleasant having always to do some explicit action to get further data, like the commit message, by moving the mouse to trigger the tooltip. And with the recent trend in screen sizes, there often is some vertical space left asking to get its Return-On-Investment 😉 . More, if in the raw commit message displayed in the tooltip some review discussion or bug report is mentioned, one has to remember the review id or bug id and manually navigate to e.g. the respective web page. Again unpleasant if having to do this multiple times. 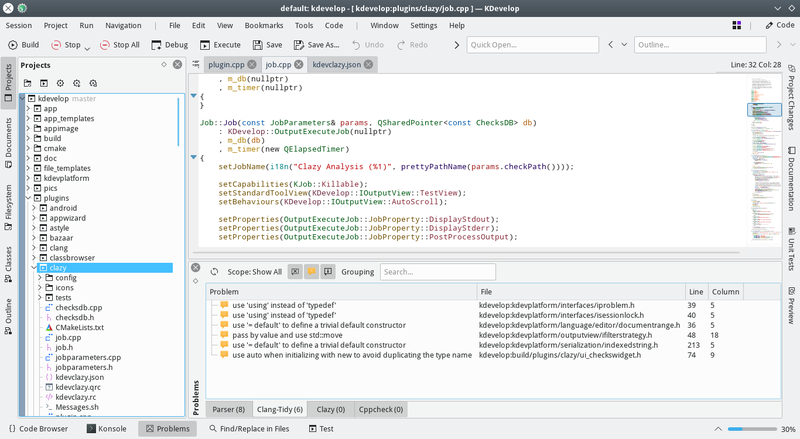 The first patch would extend KTextEditor by a new class AbstractAnnotationItemDelegate (modelled after QAbstractItemDelegate), which then gives KDevelop and other potential API users full independent flexibility to decide on which data about annotations to render and how, as developers and users prefer by the time. The second patch would change KDevelop to make use of that delegate option and change what is rendered for a start: for groups of consecutive lines from the same commit the first would show the commit message summary line, with the age of the commit, a second line would show the author. And it would make use of the KDevelop::ActiveToolTip class (as also used e.g. for code type information tooltips), which allows the user to interact with the content of the tooltip, like copying text or clicking links in the commit message, which would be shown enriched with links where feasible. The latter though currently misses some support from the KDevelop git plugin, which only delivers the message summary line in the data model (due to making use of git blame --porcelain, possibly needs rewrite using libgit2 instead of parsing git output). So tooltips for now still only show the summary line as before at least with git (did not test the other VCS plugins yet). Annotations border in a future KDevelop? 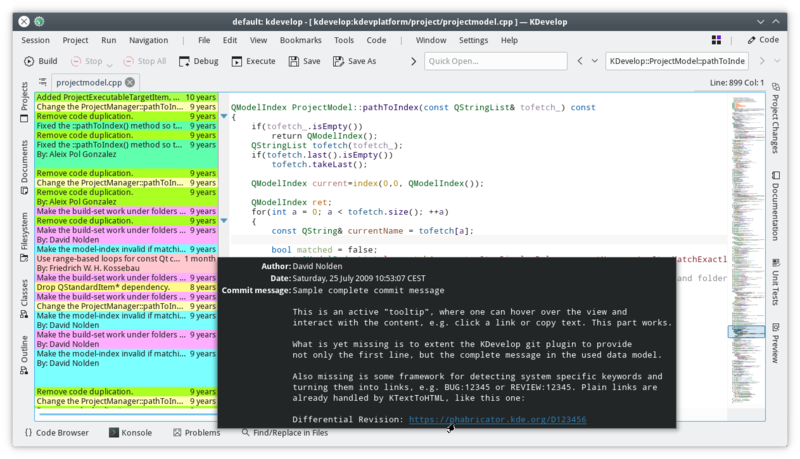 You might be aware of Clang-Tidy, the clang-based C++ “linter” tool which allows static analysis of your code, including fixing it automatically where possible. 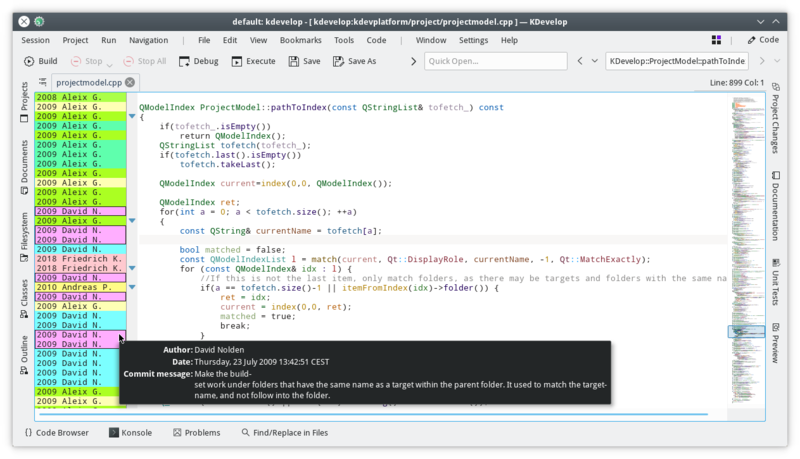 And you remember the introduction of the “Analyzer run mode” with version 5.1 of KDevelop, the extensible cross-platform IDE for C, C++, Python, PHP and other languages. 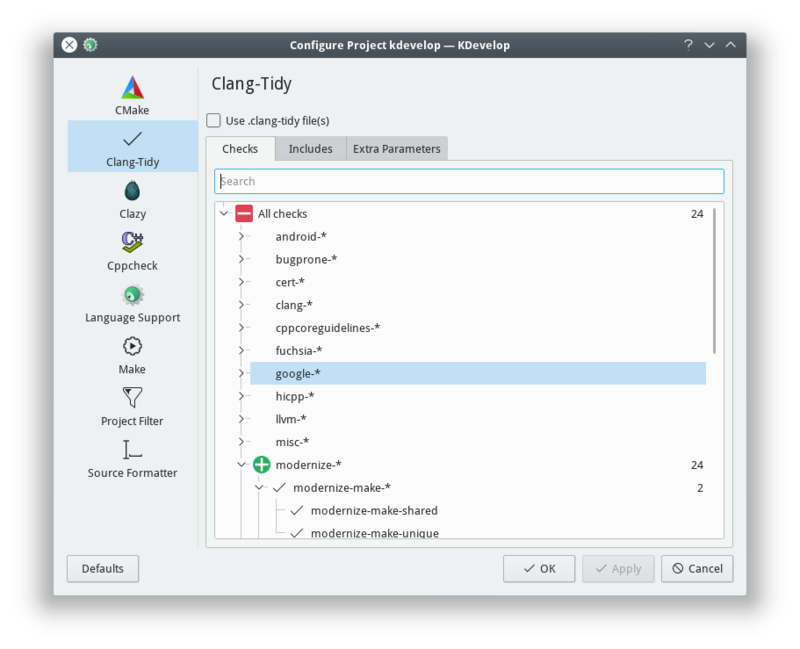 While development of a separate KDevelop plugin for the integration of Clang-Tidy was started in 2016, named kdev-clang-tidy, activity stalled after some time, with other things in life to do. One good thing about Copyleft software is that where somebody left others can pick up and continue: with Clang-Tidy getting more and more useful, there has been new motivation to have such integration with KDevelop, and after some bits of code pushing here we are now, looking at the first released versions of kdev-clang-tidy with basic functionality, which already helped to improve some code bases. 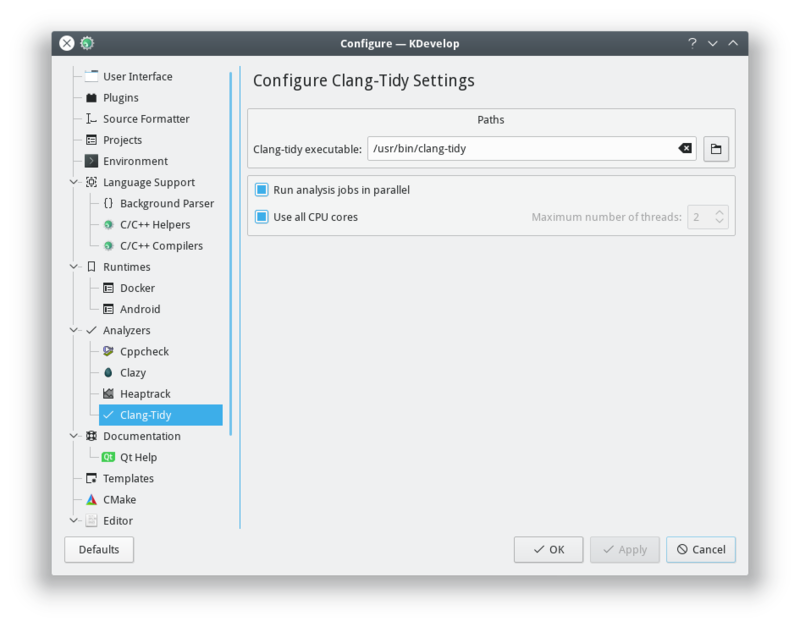 The current version 0.3 of kdev-clang-tidy can be built against the versions 5.2, upcoming 5.3 and the current development branch (master) of KDevelop. Learn more about the kdev-clang-tidy plugin from its README.md file, e.g. how to build it, how to package it, how to use it, where to report issues, and what the planned roadmap is. The latest released kdev-clang-tidy version is currently also included in the Nightly AppImage builds of the current stable KDevelop code version (which already switched to the 5.3 branch).